While Bela Lugosi was horrifying the theatergoing world as vampire, zombie, ghost or monster, his own horror-stricken eyes were fixed on a monster more terrible than any he portrayed, he disclosed yesterday. It was a secret drug habit, rising from an innocently opened bottle like some malevolent djinn, growing, towering over him, tightening its grip until it destroyed his body and threatened his mind. 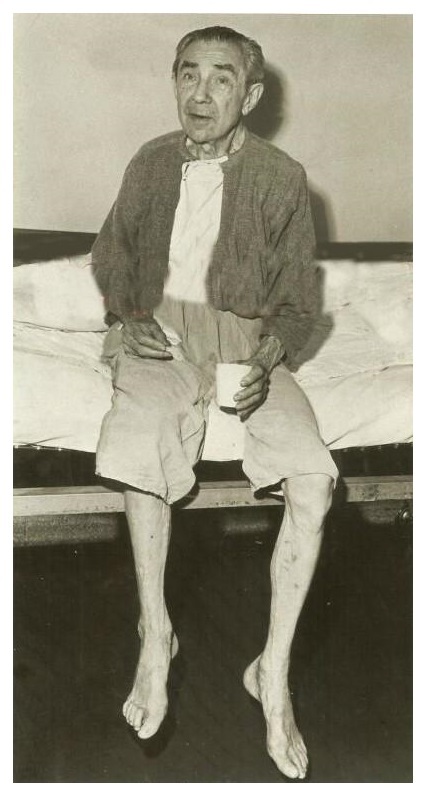 Gaunt, emaciated—looking like the ghost of a ghost—Lugosi told the Examiner of 20 years of horror while dangling bare feet and pipe-stem legs from a General Hospital cot. Ashe spoke he was awaiting a self-sought psychopathic court hearing before Superior Judge Wallace L. Ware which later sent him to the Norwalk Metropolitan Hospital for treatment and—he hopes—recovery. Tears sometimes interrupted the 72-year-old Hungarian actor’s discourse, but 50 years on stage and screen stood him in good stead. His manner was courtly, and the beautifully modulated voice, familiar made the occasion more like a royal levee than a chat with a ruined old man, clad in wrinkled grey pajamas, in a psychopathic ward. Lugosi said he concealed his addiction from friends and associates in Hollywood, although his wife, Lillian, finally learned of it. “Three years after I began the morphine I went to England to revive Dracula,” (the play which rocketed Lugosi to the pinnacle as ‘master of terror’ on the New York stage in 1927). Dr. James McGinnis, chief psychiatrist, interjected that methadone is a drug used in the treatment of addicts to “taper off” their desire for morphine, and that it is rare for one to become addicted to it. Lugosi recalled a last effort to rid himself of the drug with the aid of Lillian Lugosi, before she divorced him in 1953. With his consent, Mrs. Lugosi limited his narcotics to tapering off shots, and he had fair success, he said. But domestic problems proved unsolvable and the divorce followed. “When my wife and my son (Bela George Lugosi, now 17) went away it broke my heart,” the actor said. His voice broke and tears streamed his withered cheeks. “God bless you, judge.” Lugosi replied. Actor Bela Lugosi, who earned lasting fame as a portrayer of horror movie characters, yesterday described a personal life of narcotic addiction that had rivaled his screen roles over a period of two decades. He recited his own terror story of addiction to Superior Judge Wallace L. Ware, who committed the actor to Metropolitan State Hospital at Norwalk for a minimum sentence of three months and a maximum of two years. 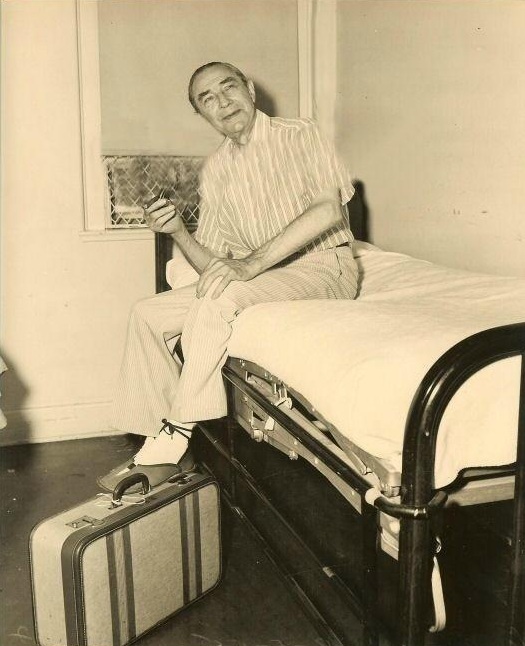 Lugosi, who said his age is 72 and his weight a skinny 125 pounds, gave an emotional account of his life under the influence of narcotics as his sat on the edge of a General Hospital cot. In contrast to the impeccable dinner-jacketed appearance he made in his most successful film appearances, he was dressed in a rough hospital pajama jacket and trousers. His emaciated legs dangled short of the floor and his fluttering hands nursed a cup of coffee and a nervously chewed cigar. “Shooting pains in my legs, back in the days when I was making ‘horror’ films made a medical addict of me,” he confessed. He entered General Hospital Wednesday, accompanied by a friend, writer Manley Hall, who he said had aided in his support for years. Yesterday, after a 45-minute hearing Superior Judge Wallace L. Ware assented to Lugosi’s plea for commitment at Metropolitan State. 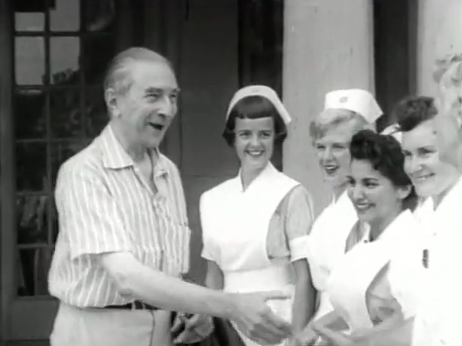 Hollywood (UP) — Bela Lugosi, committed to a hospital as a narcotics addict, was famed for frightening people. But in real life he is a quiet, gentle man who got into horror movies by mistake and was haunted by the stigma. Lugosi once was a romantic leading man on the stage. But after he achieved fame as “Dracula,” the fine actor’s career was dependent upon playing the mad scientist who pours evil potions into smoky test tubes and keeps a monster locked up in his laboratory. He had four unhappy marriages. Once during a lull in the monster movie fad, he was on relief. Now, at 72, the man who used to send chills up film fans’ spines does not appear frightening. 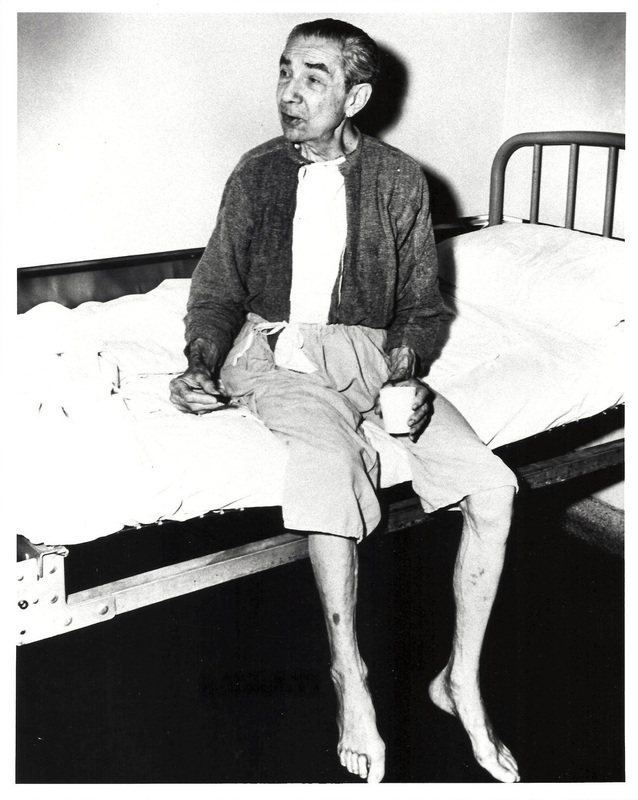 Calling himself a “broken old man,” Lugosi is in a state hospital at his own request after 20 years of addiction. Lugosi came to the United States in 1923 to appear in romantic comedies on Broadway. He was a heart throb until he accepted that hit play, Dracula. “When it closed, Bela Lugosi was a monster in human form. The only work I could get was in monstering,” he sadly said in a recent interview. He played Frankenstein’s monster, after once turning down the role in favor of Boris Karloff because the make-up was uncomfortable. Lugosi last played the monster’s sidekick with the broken neck. In 63 horror films he killed more than 300 characters. He was hanged, burned, frozen, smothered by lava and drowned in swamps on the screen. He was a zombie, a bloody phantom, a hungry ape and a vampire with steel claws. In the early 30’s the monster man had a mansion, two cars and a fat bank account. Then British censors laid down the law on horror pictures. Hollywood stopped making them. By the end of 1937 Lugosi and his wife were collecting $15 a week relief. But in 1941 a new horror movie cycle started and Lugosi worked again. Then came more lean years. Recently the one-time romantic leading man did a cruel satire of his monster self in Las Vegas burlesque house. Lugosi came home to an empty house as his fourth wife divorced him two years ago. He admits he has been eating for the last few weeks because of generosity of friends. The bushy-browed actor actually was afraid of newspaper reporters, child actors, noise of any kind and, he told me, of dying. NORWALK, Cal. (INS) – Actor Bela Lugosi, now pathetic shell of the star who once held audiences spellbound with his portrayals of “Dracula” and other horror characters, is in the toughest role of his life today – that of trying to “kick” the drug habit. Behind the bars and walls of Norwalk Metropolitan hospital he set himself the rugged task of trying to free himself of the narcotics addiction that has, until now, been his private and secret horror for 20 years. 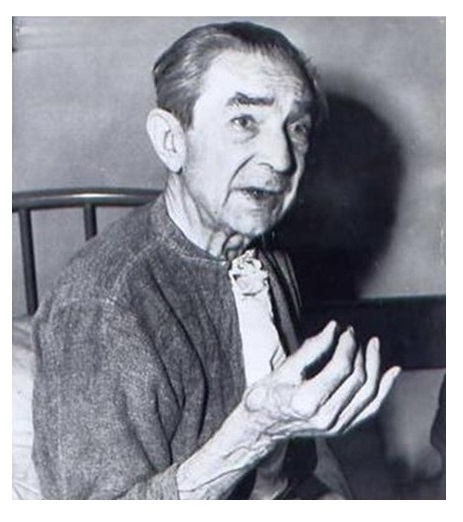 Lugosi, once a robust 180 pounds but now wasted away to a mere 130, was committed to the hospital at his own request after a bed-side hearing conducted in the psychopathic ward of the General hospital by Superior Judge Wallace L. Ware. The former star, 72, was given a minimum sentence of three months in hospital and a maximum of two years. 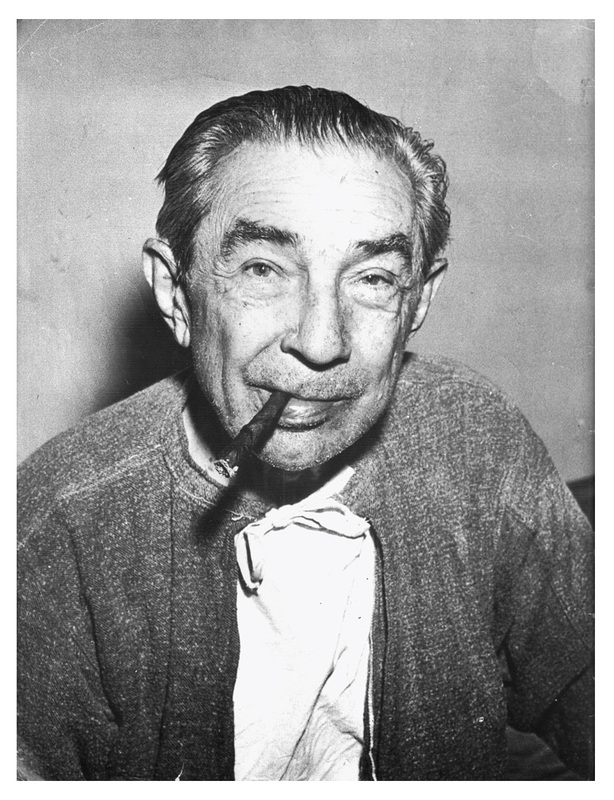 Lugosi, once so handsome he was known as “the Barrymore of Budapest” in the Hungarian capital where he first achieved acting fame, was gaunt and emaciated as he talked to newsmen before the hearing. His legs looked little more than pipestems as he dangled them over the side of the hospital cot. “I don’t have a dime of it left. I am dependent on the goodness of friends for my food. I get a small pension which takes care of the rest. In an effort to escape the addiction, he switched to a substitute, methodone, which he first learned about and first used in England while doing a revival of “Dracula” in London. Later he used another narcotic in combination with the methodone and took heavy dosed of sleeping pills as well. He was such a slave to the drugs he went without food to buy then. 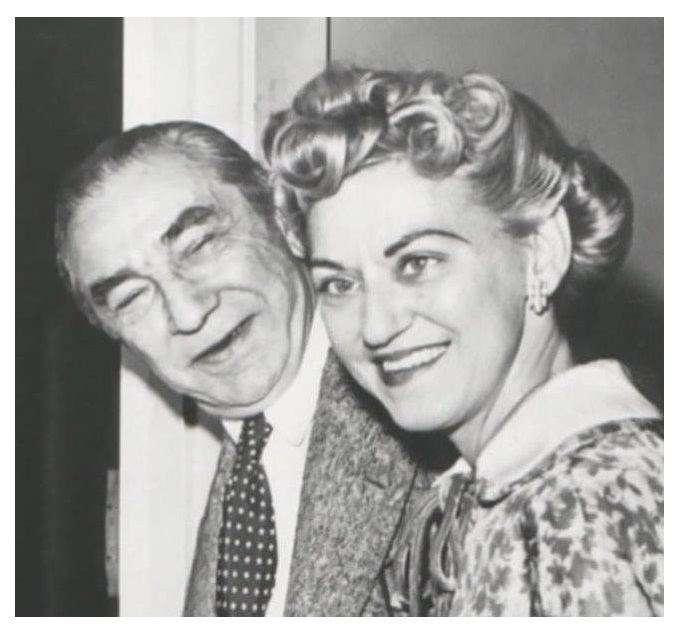 Lugosi said he beat the habit once, before his wife, Lillian, divorced him in 1953. With his consent, she give the drugs to him and tapered them off until, finally, all he was getting was “dummy shot. But the picture changed overnight when he and his wife broke up. “When my wife and son (Bela George Lugosi, 17) went away it broke my heart. I went back on dope then. That was actor Bela Lugosi’s comment Friday as he prepared to end next Friday a three month stay at Metropolitan State Hospital, where he says he has been cured of narcotics addiction. Ten days after leaving the hospital he will start work in a new movie. Too ill to go into court, the emaciated actor was given a hearing in a hospital ward. He said he started using morphine to deaden leg pains 20 years ago, later gave up morphine but used various other drugs thereafter. 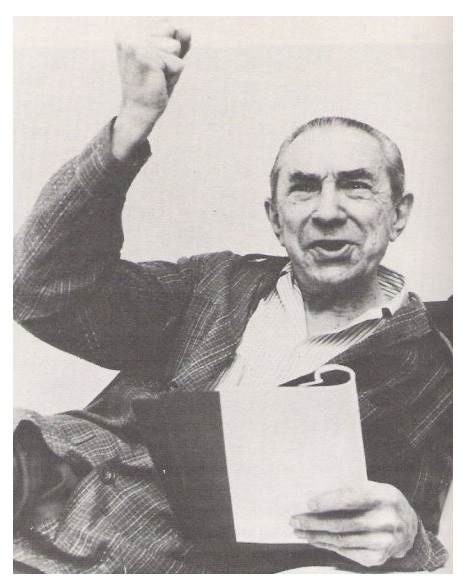 Lugosi said he hadn’t a dime left of the half million dollars he said he had made in films. He said his hospital stay was brightened by thousands of letters from all over the world, including Egypt and South Africa. 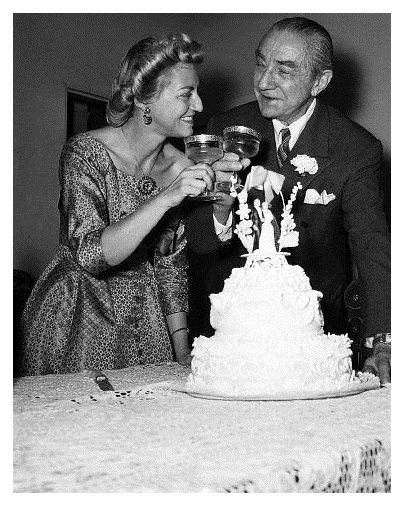 Lugosi and Hope Louise Lininger, 39, an RKO Studio cutting room clerk, were married shortly after 8 pm at the home of Manley P. Hall, author and founder of the Philosophical Research Foundation, 2308 Hillhurst Drive. Hall, an ordained minister and long-time friend of the actor performed the simple ceremony in his living room surrounded by objets d’art of the Far East while photo flash bulbs winked. The bride, a devoted Lugosi fan for more than 20 years, wore a blue-and-gray silk print and Lugosi a gray business suit. Best man was the actor’s 18-year-old son, Bela, Jr., and dress and matching accessories matron of honor was Mrs. Pat Delaney, a friend of the bride.